A new senior living apartment complex is opening November 1 in Falmouth, on the site of the Sampson D. Plummer School, 192 Middle Road. Blending the charm of a historic building with modern conveniences, this new community will provide residents a carefree place to live independently with access to shopping, trails, the Mason-Motz Activity Center and a whole lot more. The project is a conglomeration of owners: John Wasileski, who owns the nearby Oceanview, Kevin Bunker from Developers Collaborative and Matt Teare and Chris Wasileski from Sea Coast Management. Benchmark is doing the construction and Gawron Turgeon Architects, P.C. designed the space especially for seniors. Each of the 34 apartments has a special quirk or piece of school nostalgia from a chalkboard railing to the original wood floors. One apartment has the old stage and a curved wall along with the large classroom windows that have been refinished. There are many original school doors used for the entrances to the spacious apartments. The apartments on the second floor have very high ceilings. The smallest apartment is 500 square feet and the largest is 1,300 square feet. Four of the apartments are ADA compliant and will accommodate a wheelchair or electric scooter. Each apartment comes with a parking space with extra space for visitors. The apartments have individual heat pumps and the original building has baseboard heating that is controlled by the building. Construction began in spring of 2016 and should be completed by November 1, 2017. The property aims to help the “middle market” seniors who make too much for low income and not enough to pay for the high-end rentals. Developers Collaborative specializes in historical businesses and the refurbishing of schools into living spaces. This is the first senior living space, but the company also refurbished the Nathan Clifford School and Rosa True both in Portland. “It’s neat how they work through the spaces,” she said. One of the amenities to living at Plummer Senior Living is an on-site services coordinator, who will be available in the main office five days a week to help be a liaison to connect residents with services in the area; like transportation for groceries, medical appointments or to have a meal plan delivered daily or weekly. “If they don’t know how to navigate things, this person can help,” said Purington. There is also a community room, which will be open to all for socializing, monthly meals, movie nights and anything else the residents would like. There will be landscaping all around and professionals will take care of that and maintenance and snow removal. “As we see who the residents are, we will plan things like art shows or a sewing circle,” she said. “There is a real need,” said Purington. People want to stay in the area, but can’t afford to. “People need a place to live independently within a community where it’s not going to break the bank.” The lifestyle and the carefree living are worth the time to see Plummer Senior Living. Right now renters have a great selection of apartments on all three floors. And the first floor of the new wing accepts pets. DC Management is handling the marketing, leasing and management. 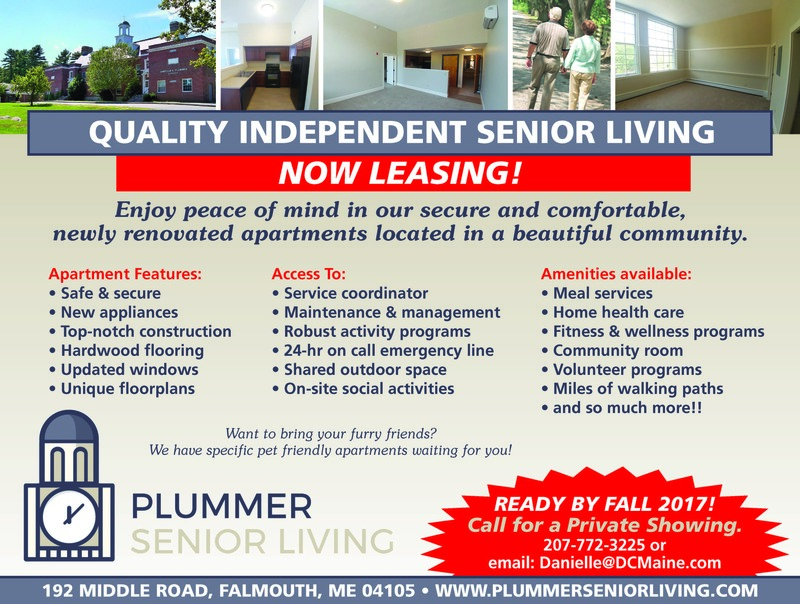 For more information or to schedule a tour, visit www.PlummerSeniorLiving.com or call Danielle at 207-772-3225 or email Danielle@DCMaine.com.